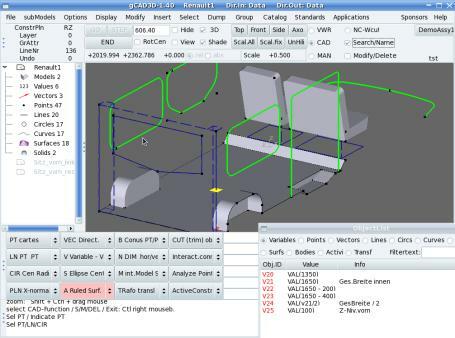 gCAD3D is a 3D CAD CAM application that features an integrated 3D OpenGL viewer, a program interpreter for geometry and NC-commands in 3D, an integrated NC-processor, and a programming interface for user programs. It has support for importing Step files and support for both importing and exporting Iges, DXF, and VRML files. This application requires GTK+ version 2.0.x. Other dependencies include: glibc 2.3.3, GTK+2, OpenGL(Mesa). Recently, gCAD3D released version 1.82 with bugfixes. Use sudo dpkg -i PACKAGE.deb to install the Deb. It may prompt to install the dependencies. Use sudo apt-get install to install them. 1 user responded in " Install gCAD3D, the Open-Source 3D CAD CAM Application in Ubuntu "